Candy making is not my forté. I’ve experimented many times in the past, usually while attempting holiday gifts, with toffee, pecan caramel turtles, candied orange peel, hard candy lemon drops, and I can’t tell you how many batches I’ve ruined and how many serious stovetop messes made me contemplate simply moving rather than facing the clean up. I seem to be forever overcooking the sugar/syrup, probably due to a cheap, inaccurate candy thermometer, resulting in caramels that would break your teeth and hard candies that are burnt beyond recognition. In addition, I try to eat healthfully and candy is the ultimate ‘junk’ food – pure sugar and little else. Not to mention that the only local sugar is maple sugar, and with organic maple sugar at about $40/lb, I’d be better off buying everyone filet mignon. However, let no one say that I am not dauntless in the face of adversity. 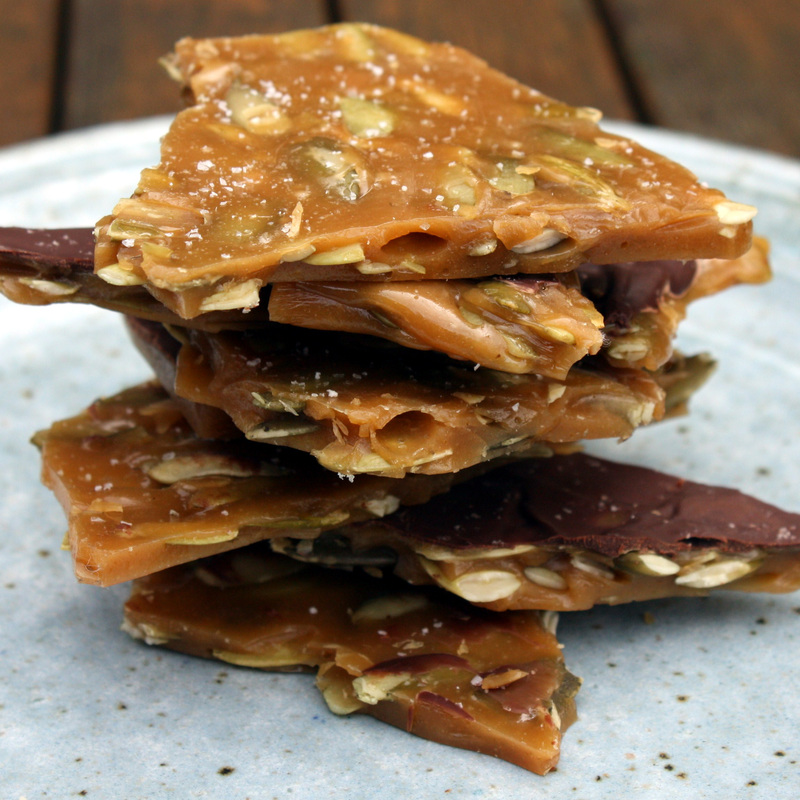 Having seen the pepita brittle recipe on Smitten Kitchen, and needing a gift for a sweet-tooth uncle, I decided to give it a go. Almost immediately, I ran into a common (for me) candy-making problem; the recipe states that the caramel/syrup is done when it reaches a “medium golden color.” Well, not only is that pretty vague, I am cooking with raw sugar – already “medium golden.” Still undaunted, I found a recipe for Almond Toffee in my trusty copy of Rose’s Christmas Cookies, and decided to cook the syrup to 285 degrees F. I also decided to use my digital thermometer, in addition to the candy thermometer that Tai continually swears “works great” (like he would know, with all the candy he’s made in the last decade – not), yet has resulted in many a batch of brick-solid “jam.” The result? When the digital thermometer read 286 degrees, the candy thermometer read about 260. I rest my case. Luckily for me I had the digital thermometer; this recipe was quick, easy, and very addictively delicious. The only problem may be actually getting any into the mail as gifts! Coat a rimmed baking sheet (12 X 16 inch) with butter or oil spray. Add sugar, butter, corn syrup and water to a small stockpot and stir until sugar is wet. Measure out the baking soda, salt, vanilla and pepitas and have at the ready: once the candy is done cooking, you will need to move quickly to add the last ingredients and spread the caramel before it cools and hardens. Cook sugar mixture over medium-high heat, stirring constantly until butter melts, then frequently to prevent scorching. Cook until a candy or instant thermometer reads 285 degrees F (about 10 – 15 minutes; at around 200 degrees F, the syrup will visibly thicken and the foam will subside some, then the mixture will become thicker, more opaque, and start to look sort of like pancake batter), then remove from heat (the temperature will continue to rise to 290 degrees F). Quickly whisk in the baking soda, vanilla and salt. 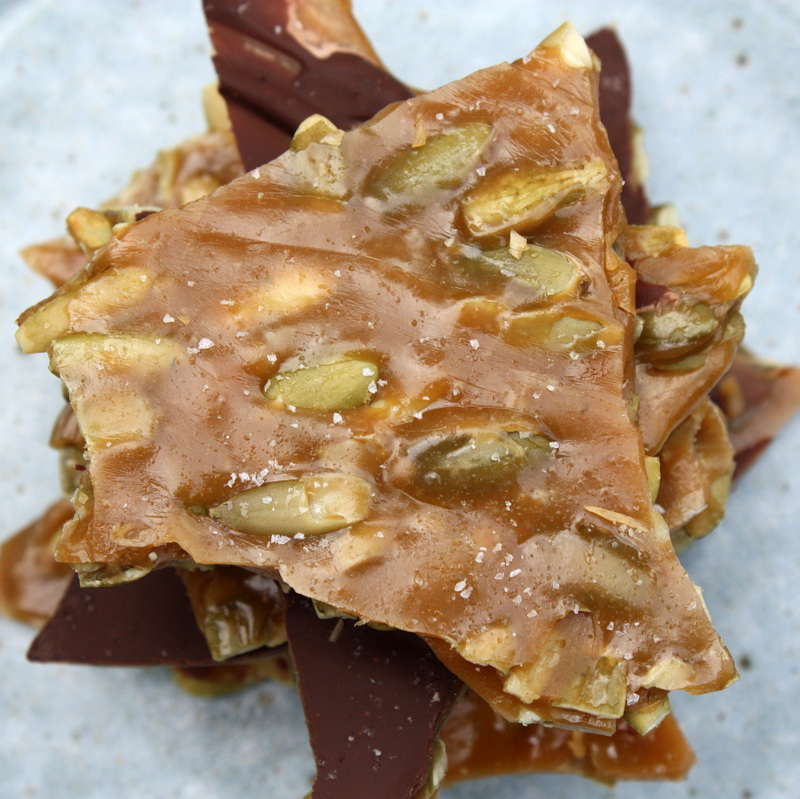 Fold in the pepitas and quickly transfer the candy to the greased baking sheet. Spread the caramel thinly, trying to cover the entire surface of the sheet, with a plastic flexible spatula or the back of a large spoon. If you like, chop some good quality chocolate into 1/2-inch squares and scatter about the top of the brittle (I covered half the brittle for the best of both worlds). Press the chunks down with your hands to start them melting; in about 3 or 4 minutes the chocolate should be melted enough to spread over the brittle with your spatula. Sprinkle a little additional Kosher salt over the chocolate and brittle before it completely cools. Allow the brittle to cool completely in the pan, then break up with your hands, the back of a knife, or a meat tenderizer. Yields about 1 and 1/2 pounds. Peanuts, cashews, pecans, almonds, maybe even a seedy mixture of sesame, sunflower and pepita? The options are endless. My caramel did not turn as nicely brown as Deb’s did on Smitten Kitchen. Perhaps I cooked it a little bit fast and it needed more time to caramelize; mine cooked for about 12 minutes. It is still delicious, but next time I will turn down the heat a bit and see how it goes. At room temperature for about 2 weeks. You may want to separate layers between waxed paper or parchment, especially in humid weather. In defense of my thermometer – the sugar was at Hard Ball stage: 260. If you make this recipe, make double – because you’ll eat half. It’s ridiculously good. If it was really at 260 degrees, when cooled, it would have had the consistency of marshmallow or gummy bears.